My weekly boxes. All the packaging gets recycled, just leave them out for your driver. So how do we manage to feed our family without going to the supermarket? For the bulk of our purchases we use two local businesses. One is Pure Pastures, which I will discuss in a future blog. 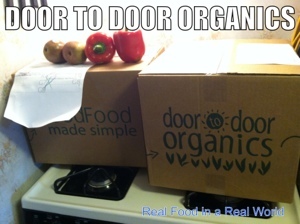 My major source of food is Door to Door Organics – Michigan. Door to Door Organics is a service that provides once a week home delivery of organic fruits and vegetables, along with a huge shop of other grocery items. You can learn more here. To save a few dollars they have a co-op option available that I take advantage of. My co-op is at their warehouse in Livonia Michigan. You go to the warehouse on pickup day and any one of their awesome employees will grab your boxes for you, and even help you load them into your car. Every single employee I have ever interacted with is great. They all seem passionate about their jobs and happy to be there. I love grocery shopping from my sofa. The convenience cannot be beat. My order comes on on Wednesdays, so I get an email the Friday before with the listing of what is in my box that week. They have 4 box sizes to choose from: bitty, small, medium and large. When we still used the supermarket, we used the bitty option. Right now we get the medium box once a week. Their shop is an amazing feature. Once you have a box delivery set up, you can add as many items as you like from their shop. I typically add milk (in glass jugs that get returned, no waste!) 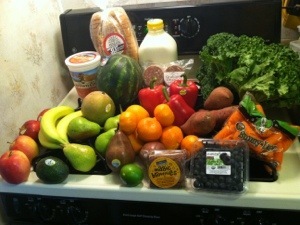 yogurt, bread, tortillas, meats, and additional fruits and veggies I know we will need that week. All of this delivered to your door, or if you join a co-op it will be delivered to your co-op. This weeks order. A medium box plus a few extras. Total cost was just under $60. I like to call myself the ultimate Door to Door Organics fangirl. I tell everybody about them! I get beautiful wholesome food for my family, and I don’t have to go to the store. They are constantly expanding their offerings and have recently begun to carry a huge assortment of yogurts, sour cream, butter and many other products. They are a no obligation company which I love. Need to cancel? Just click a button. Vacation? Just put the dates in that you don’t need delivery. About a year ago, money was tight so we had to cancel for a while and it was literally just clicking a button. No phone calls, just a button. Now I’m back and I will never leave! Want to try them out? I can send you an email link for 50% off your first box. For every redeemed invitation in March 2013, the company will donate 5lbs of organic produce to a local food bank. That sounds like a whole lot of win to me! I’ve looked into this site before but it seemed pricey and I’m feeding a family of 1.. Big absolutely love the idea of all locally grown produce and meat products! I’m going to check it out again!! I am a serious Door to Door Organics fangirl, they are amazing. It can seem pricey at first, but once I took the time to really think about what I was buying and what I save not going to the grocery store, I think it is a fantastic value. I can email you a coupon code if you would like, just email me realfoodinarealworld(at)gmail(dot)com.